When I was a child, I recall stories and anecdotes, related to me by adults, of the power and wonder of the children’s book The Little Prince by Antoine de Saint-Exupery. Subsequently, the book assumed a somewhat mythic aura that intimidated me to a sufficient degree that I delayed its reading. Then one day, I came across a copy and made the decision to open myself to its power and, thus, move to a higher plane of understanding and awareness. However, I was sorely disappointed and found the story ridiculous and pointless. Move forward in time by many years to the present, and I, now an adult, found myself once again gazing at the cover of The Little Prince with its seemingly prosaic sketch, this copy having been returned to the library in which I work. It is then that I decided to reread this book from my past and gauge the tale from the viewpoint of an older person with far more life experience, and my reaction could not have been more different. I no longer viewed the simplicity of the story as ridiculous; rather, this only added to the clarity of its messages. And the plot that I previously saw devoid of any real action and, therefore, pointless, now conveyed to me a story of sublime profundity. When I think of how other authors investigate the same themes of this book – the journey from childhood to adulthood, love and friendship, avarice and pride – my awe of what Mr. Saint-Exupery accomplishes in less than one hundred pages only grows. It is no wonder that The Little Prince has sold more than four million copies and been translated in to over two hundred fifty languages and dialects since its publication in 1943. 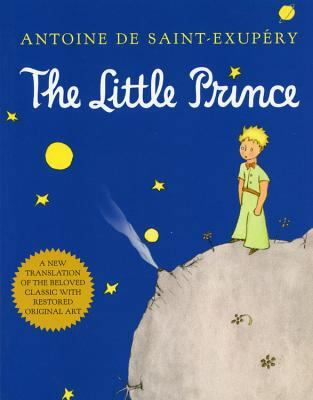 This past Saturday, my book discussion group met and discussed The Little Prince, based on my recommendation, and in my fourteen years with this group, this was one of the best discussions, in my mind at least, we have ever had. And I found it interesting that several who remember reading it when younger were also unimpressed at their first readings (one even threw the book in the trash after its finish), and upon this second attempt, everyone seemed quite moved. For this reason, I encourage a revisit or even a first reading of what is now a favorite book. This entry was posted in Reviews and tagged Book Discussion Groups, Children's Fiction, Rob on January 7, 2019 by robgieszl. The world presents before us a dichotomy: the good and the bad. While this may well be a grossly oversimplified view of our world, my point is that we experience in our lives both good and bad, highs and lows, etc., and it seems far too easy to become focused on those less pleasant aspects of our lives here on earth. With this in mind, I felt it appropriate for my review this month to be of a book whose focus is the pleasant, a simple “feel-good” story. And why not? It is immensely satisfying and uplifting to read about the wonderful things of which people are capable, and Juniper, the Happiest Fox is a book that very much accomplishes this. Ms. Coker is a person who has since childhood felt a great love for all animals, and as she aged and collected experiences in veterinary clinics and animal rescue organizations, the fox became an especially beloved creature for her. One day, she received word that there was a litter of kits in need of a good home. When she arrived, the runt, who was no larger than the hand of a small child, called to her heart, and since in Native American culture juniper is employed to keep negativity at bay, it seemed the perfect name for this tiny ball of fur with an unforgettable snaggletooth that added to her perfection. Thus, the adventures, filled with trials and tribulations, began for Ms. Coker and her Juniper. This is a short read filled with anecdotes and lovely pictures that depict the love and affection that is possible between man and “beast.” I would recommend this for anyone in need of a pick-me-up in a world that, perhaps, offers too many opportunities for pick-me-downs. This entry was posted in Reviews and tagged Adult Non-Fiction, Foxes, Pets, Rob on September 29, 2018 by robgieszl. 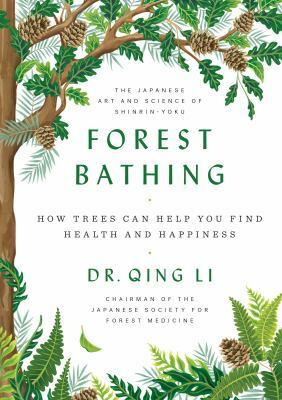 Dr. Li, Associate Professor at the Nippon Medical School in Tokyo and Chairman of the Japanese Society for Forest Medicine, has recently authored Forest Bathing: How Trees Can Help You Find Health and Happiness, a charming book that details Shinrin-Yoku, or forest bathing, which in Japan has become a widespread preventative therapy to assist in promoting one’s optimal health. In reaction to these trends, Dr. Li sets before the reader the case for increasing one’s exposure to and time within a forest and includes scientific and well-documented research on the benefits of forest bathing that includes, among other things, a reduction of blood pressure, increased energy, the strengthening of the immune system, and heightened concentration. And one need not spend countless hours in a forest; rather, an excursion of as little as two hours is sufficient time to reap some health benefits, which is welcome news considering the hectic nature of everyday life in the world today. Interspersed among the book’s pages are wonderful pictures depicting beautiful trees and forest scenes, an addition that adds considerably to the beauty and appeal of this book. This entry was posted in Reviews and tagged Health, Hiking, Nature, Rob on August 2, 2018 by robgieszl. While The Shadow of the Wind is not the first book to have found its way into my heart, the story and its characters most certainly sculpted a palace in my memory, a labyrinthine palace populated by a wide assemblage of characters. 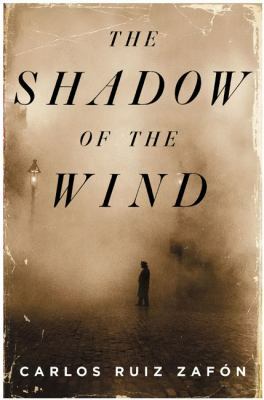 The Shadow of the Wind takes place in Barcelona, Spain, in the years after the Spanish Civil War, which, as with many civil wars, was especially bloody and brutal. The protagonist, a young boy named Daniel Sempere, assists his father in the family-owned bookstore. When Daniel is ten years old, his father takes him to the Cemetery of Forgotten Books, a secret and magical library where books consigned to oblivion are kept waiting for the day when a reader discovers them. On this occasion, since this is Daniel’s first visit, he is allowed to choose a book. And it is his particular selection and the mystery surrounding its author, Julian Carax, that begins a quest for Daniel in which he journeys into the shadows of Barcelona in search of answers, a journey in which he meets both friend and foe and learns a great deal about life along the way. This is a captivating story peppered with mystery and suspense, love and hate, humor and terror with these elements combining to form a true tour de force. And I would say that The Shadow of the Wind has tremendous spirit and strength. This entry was posted in Reviews and tagged Adult Fiction, Barcelona, Censorship, Libraries, Rob, Spain in the 1960's, Spanish Civil War on November 8, 2017 by robgieszl. Perception versus reality – how often are the two completely unrelated? Throughout the years, numerous authors, philosophers, poets, and others have attempted to explore this question. Mr. Henry James, that behemoth in the firmament of American literature, employed, for example, his novels to aid in developing within the reader the ability to move past perception and into reality. Now, what has this to do with the debut novel, The Unfortunates authored by Sophie McManus, you may ask, about which this review was to focus? Well, I believe that Ms. McManus has aptly succeeded in giving the reader characters who, on first meeting, leave a very particular impression. Cece and her son, George, heirs to a great robber baron fortune, seem cultivated, polished, and self-assured. But once again, it is what lies beneath, hidden from sight, that is most important, and as the novel progresses, Ms. McManus begins to provide subtle hints that, when upon close inspection, there are actually cracks in the marble and all that glitters is most decidedly not gold. This strong debut novel draws realistic characters who lead lives of quiet desperation, a desperation that slowly becomes visible as subtle hints become more pronounced when failures and tragedies are no longer avoidable and must then be faced. And small decisions of the past, seemingly insignificant when taken on their own, rise from that past and merge to create unforeseen disasters. Or were they foreseeable? 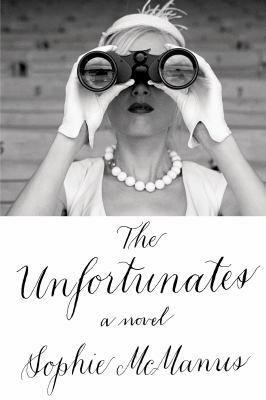 Decisions of her past, in Cece’s parlance, constitute “the unfortunates.” Ah, the euphemism is such a useful tool in that wonderfully human game of self deception. This entry was posted in Reviews and tagged Adult Fiction, Rob on August 5, 2017 by robgieszl. In my reading life, there is a selection of choice books that I refer to as my carousel reads. These are books that I read time and again, with the common thread among them being the wisdom, inspiration, and uplift I believe they have brought to my life. 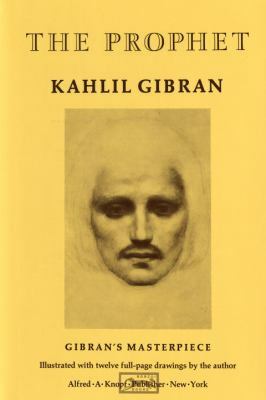 The other day, and for reasons still unknown to me, my copy of The Prophet by Kahlil Gibran, which I inherited from my paternal grandmother, called to me from among the scores of other books surrounding it in the bookcase where it rested, saying, “It is time.” Since I am one who is rarely contrary to talking books, I removed it from its repose and began to read. Wow. I would say this statement provides a definite perspective. As to The Prophet, first published in 1923, it is a brilliant meditation upon life and the conditions in which we humans find ourselves, conditions not rooted in a particular religious philosophy or nationality; in other words, it is universal. Ruminating on such subjects as love, work, friendship, and beauty, the reader is provided a lens through which life is examined with a unique perspective, and it is this perspective that I find refreshing and is the reason for my return to its pages. With countless other profound phrases and erudition, I imagine that The Prophet would make for a strong candidate for the select lists of carousel books of others; thus, joining in a perpetual celebration of the human condition that this lovely book provides. This entry was posted in Reviews and tagged Poetry, Rob on June 11, 2017 by robgieszl. On May 11, 1970 in the North Carolina town of Oxford, an African American man named Henry Dortress Marrow, Jr. was viciously beaten and murdered in public by three white men who would all three be acquitted by an all-white jury of this horrendous, cold-blooded crime. In response to this travesty of justice, there were demonstrations, riots, and a months-long boycott by African Americans in the community of white-owned businesses that eventually forced the leaders of Oxford to end segregation practices there. That’s right, end segregation practices in 1970, despite the passage by the Congress of the Civil Rights Act of 1964. This is very difficult book to read, and I am not referring to the writing or narrative style. The violence and injustice that is recorded within its pages is repugnant and infuriating, but this is an important story to hear. I feel certain that there may be some who would say: Why write this book and drudge up hard feelings? Nothing good can come from it. To these people I would reply that in order for a country and its society to move forward as a unified people, it is essential to study the past, most especially those events that continue to divide, so that chasms may close and wounds healed. 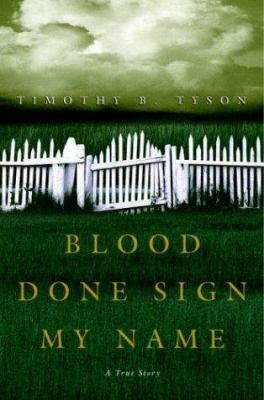 Mr. Tyson, the son of a white Methodist minister who was a strong and public advocate for the Civil Rights Movement, was ten years old and living in Oxford at the time of Mr. Marrow’s murder, and it is this crime and its fallout that shaped the person that Mr. Tyson developed into as an adult. The reader joins Mr. Tyson in reflecting very deeply upon the Civil Rights Movement and the history of race relations in the United States, which leads to a litany of questions. How does one define freedom? How is change most effectively encouraged by a movement? What is the current state of race relations in America today? It is absolutely vital that these and additional questions be examined by all, as the future of our country really does depend upon everyone facing our past in order to understand the present so that we may make progress together as a single people. And Blood Done Sign My Name serves as an emotional and powerful impetus for just such a purpose. This entry was posted in Reviews and tagged Adult Non-Fiction, American History, Civil Rights Movement, Murder, Race Relations, Rob, Segregation on February 27, 2017 by robgieszl. The proper role of religion in the United States of America has been a source of debate since the beginning of the country, a debate that continues to this very day. Political parties, social institutions, and individuals all put forth their varied opinions as to the appropriate level of influence religion should have in the public and government sectors. The tyranny of the present. In other words, there is nothing new under the sun, and Mr. Meacham certainly has a large body of work by some of the most progressive and brilliant thinkers in history to consult on this matter. And he does not simply repeat oft-heard quotes or ideas (i.e., “a wall of separation between Church & State” taken from a letter written by Thomas Jefferson in 1802); rather, he provides the context from which these quotes were taken, which allows for a greater understanding of the intent of the author. 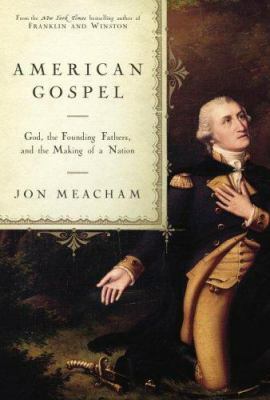 While this subject matter is rather complex, Mr. Meacham displays a true talent in relating it in a manner that is easy to understand, and this, I believe, is what makes American Gospel so remarkable. Furthermore, considering the import of this topic to the nation, it would seem advisable for all to become more familiar with it so that one can be in a better position to make informed decisions as an individual citizen. After all, an informed electorate is essential to the success of a republic such as ours. This entry was posted in Reviews and tagged Adult Non-Fiction, Founding Fathers, Religion, Rob, U.S. History on January 3, 2017 by robgieszl. 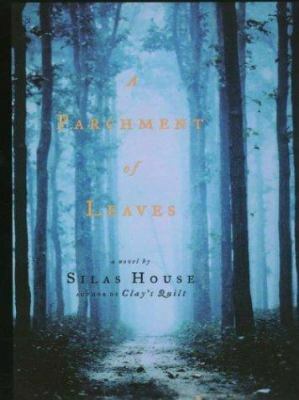 I recently had the opportunity to facilitate a group discussion of A Parchment of Leaves by the great Kentucky author, Silas House. While I enjoyed the book tremendously, there was another aspect of this novel that I came across during my research in preparation for the book discussion that I found equally wonderful: the poetry of Kentuckian James Still. You see, it is a poem by Mr. Still from which Mr. House derives the title of this book. The poem, entitled I Was Born Humble, is a truly awe-inspiring contemplation, in my mind, of life in general, life not necessarily rooted in the place of Kentucky. And stone; and upon oaks full-bodied and old. Beneath this wealth of wisdom perished with the leaves. My reaction is the same each and every time I read or recite these lines: an overwhelming sense of both joy and sorrow. But isn’t life, after all, both joy and sorrow? It is here that I must admit that I oftentimes find poetry somewhat inaccessible. While I admire and am familiar with the household names in this genre, such as Elizabeth Barrett Browning, Langston Hughes, Walt Whitman, and Robert Frost, it is when I branch out to lesser-known poets that I find myself a bit befuddled. This, I hope and believe, will no longer be the case, as I find a renewed interest in such structured musings and now possess the resolve to venture further. Hitherto, I have always turned to fiction to better understand history, tragedy and triumph, the human condition, etc., but it seems to me now that there is an additional literary vehicle available to me by which I can come to a better understanding of the world. They say that a thing is better late than never, an expression that I take solace in on this new, and somewhat belated, journey into the realm of that most objective of aesthetic art – poetry. This entry was posted in Reviews and tagged Kentucky Authors, Poetry, Rob on September 26, 2016 by robgieszl. While I find beauty and wonder in all creatures both great and small, I must admit to a particular fondness for the canine. In fact, I will often introduce my own dog, a wire fox terrier named Thatcher, as my first child. There seems to be a particular connection, an unspoken bond, between the human and the dog seldom found with other animals. Additionally and in regards to literature, I count Virginia Woolf as one of my favorite writers. Ms. Woolf, in my mind, penned some of the loveliest and most sophisticated novels to be found in the literary firmament. With her use of various experimental styles, most prominently stream of consciousness, she creates such wondrous scenes with her prose that one feels as if one has actually entered a painting in the impressionist style, where characters and setting do not possess definite lines or boundaries and both are viewed through an enchanting haze of color and light. How are these two interests connected, you may ask. 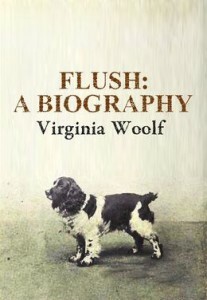 The answer: Ms. Woolf published a short book entitled Flush: A Biography in 1933 concerning a cocker spaniel of the same name and his experiences, as told from his perspective, with his mistress in nineteenth century London and Italy. Certain historical items are learned, which would, I imagine, otherwise escape the reader. For instance, dognapping for the criminal purpose of demanding a ransom was common at the time, with owners sometimes paying large sums; in fact, in this story Flush finds himself the victim of such an abduction, and his narration of this is quite moving and harrowing. In addition to the unconventional stylistic approach of relating a story through the internal musings and observations of a dog, Ms. Woolf further employed this book as a means of providing the reader with a fictionalized look in to the life of one of the most popular and respected poets of the Victorian era, Elizabeth Barrett Browning, who did indeed own a cocker spaniel to whom she dedicated some lovely poetic lines. Imagine your biography written by a close household pet; what an interesting story that would be. Flush is a highly readable and entertaining tale that I would recommend to anyone, really, but most especially to the fellow lover of the dog and of the incomparable Virginia Woolf. This entry was posted in Reviews and tagged Adult Fiction, Cocker Spaniels, Elizabeth Barrett Browning, Fictional Memoir, Human-Canine Relationship, Rob, Virginia Woolf on March 23, 2016 by robgieszl.